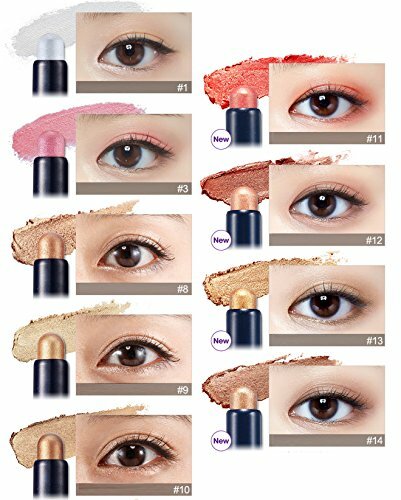 If you’ve ever struggled with getting your eyeshadow to look good, or just too lazy to blend properly in the early morning, products like this eye stick should definitely be in your makeup pouch. I’ve always appreciated the convenience that comes with stick products (like MISSHA’s blush), so I had this on my wishlist for some time. Each eyeshadow shade has a different ingredient list, because the colours are created using different pigments and chemicals. Top ingredient, C12-15 Alkyl Ethylhexanoate, is “determined safe for use in cosmetics, subject to concentration or use limitations”. Second most common ingredient, Mica (Ci 77019), is actually a natural shimmer pigment that’s deemed safe for cosmetic use. A potential ingredient for concern is Tin Oxide, but they’re generally deemed to be safe in small doses. As it is the second-last ingredient listed, you can rest assured that the amount used is quite small. I’m a huge fan of Etude House’s eyeshadow palettes because of the colours, but not so much for the colour intensity. I like how wearable the shades are for everyday looks, and I honestly had a very hard time trying to decide which one to buy. I eventually settled for #12 Sunset Star, an orange-brown colour. Packaging: It’s quite small and convenient to bring around – in fact, I feel that this is much more compact than eyeshadow palettes. It also looks like a crayon, which is great for giving the impression that applying this is gonna be as easy as using crayons to draw. Texture: The texture is different from those of the usual Etude House palettes, which tend to be more powdery. This product is creamier in texture, and definitely much easier to apply evenly on the eyelids. I do get the feeling that it can get rather oily though, so you might not want to use this together with oil-based eyeliners. Colour payoff & intensity: I’ve often commented on Etude House’s eyeshadows don’t give a great colour payoff, unlike what they look like in the palette, so this honestly came as a nice surprise. You can see from the swatch that the colour is actually pretty intense just with one swipe, which I really like. there’s a bit of glitter – not too over-the-top for a natural look in the day, but still glamorous enough for a party at night. You also don’t have to further blend the colour with your finger or a brush because the colour is already quite well-blended out upon application (how convenient!). Colour: You may not be entirely comfortable with using orange eyeshadows, because too much of the colour can make your eyes look like they’ve been infected. However, I would say that this shade works well for most skin tones, especially if you have warm undertones. The other colours should also work well – after all, brown is possibly the most versatile eyeshadow shade ever! Staying power: I’ve tried to apply this eyeshadow without any eye primer on my eyelids, and with eye primer on another occasion. I find that the colour does seem to fade a little towards the end of the day without primer, but it’s not totally gone. My eyelids tend to be quite oily, so you might want to take that into consideration as well. Etude House wasn’t exaggerating when they promised easy application with this product. As much as I love applying eyeshadow, it’s sometimes not the most convenient step in a makeup routine because you have to really take time to choose a nice colour and blend properly, if not you’ll look like you randomly smacked some colour on your eyelids. At SGD8.90, it’s not very cheap since it’s just one colour, but it’s a worthwhile investment especially if you pick a shade that fits you very well and is versatile enough for you to incorporate into any looks.